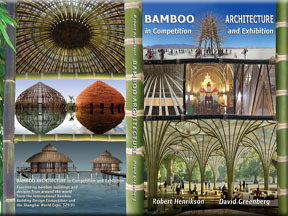 "Visionary Designs for Ecological Living"
NEW 2011 Book Bamboo Architecture on sale now at Amazon.com. 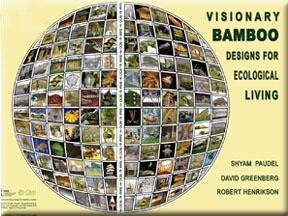 Original 2008 Book Visionary Bamboo Designs for Ecological Living. from 250 creative, exciting design submissions. Enter the Design Show. Competition Objectives: This competition was created to develop new award winning designs for bamboo buildings, raise awareness of the use of certified structural bamboo for building code approved structures, and introduce architects, designers and builders to working with bamboo as a structural material. Sponsors, Partners and Affiliated Organizations: Bamboo Technologies builds 20 models of certified building code approved bamboo houses. Countries: Registrants entered from 64 countries around the planet. Schedule: Exhibitions in Kassel Germany, Guangzhou & Beijing China and Lima Peru.